Since 2004, the “Great Lady of Soul,” aka Bettye LaVette, makes an annual pilgrimage to the Dakota Jazz Club, in part to remind us that our hearts are never buried that deep, and in part to acknowledge her self-described debt to owner Lowell Pickett for “taking a chance on an old broad” -- he booked her into the newly relocated club based pretty much on hearing one track ("Forecast") from her then-new release, A Woman Like Me. Every year, I go to two sets. 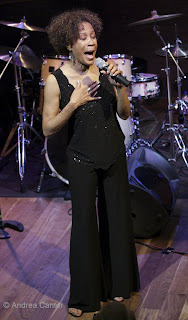 Unlike many vocalists, Bettye never sings the same set back to back. Her repertoire covers more than enough territory for a full night of song, and she wants to share it. Bettye’s story of her 46-year career reflects the worst of the recording industry—discovered as a teen, releasing a series of hit singles, she was brought into the studio by Atlantic for her debut LP recording which was mysteriously shelved for nearly thirty years while her career flagged. 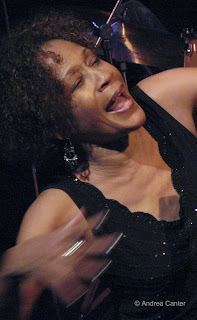 But she rose from the ashes in her 50s, saw the long-delayed release of her 1972 album (“that’s what we used to call them!” she reminded the younger members of the audience), now titled Souvenirs, in 2000, and has since issue two more acclaimed CDs and garnered Grammy nominations and blues awards. Some of her songs address the traumas and triumphs of her career, others just address the traumas and triumphs of life itself. Whatever she’s singing, she bares her soul, and in the process, she takes over a part of mine. Bettye is one of my favorite photo subjects, although she is also one of the most challenging in the dim light of the Dakota—she never stops moving. Even if her limbs are at rest (which is seldom), her face continuously relays signals from heart and mind. I’ve never even been a real fan of soul and R&B, but turn Bettye loose on “I Do Not Want What I Have Not Got,” simply a capella (and the only tune repeated over two sets), and I’m a convert. And with her high-energy band, Bettye swings and sways and engages every ear with sets covering many tunes from her most recent recordings, I’ve Got My Own Hell to Raise (celebrating women songwriters) and Scene of the Crime, the "crime" being the delayed release of Souvenirs, the “scene” the same recording studio in Muscle Shoals. The Great Lady of Soul can raise her hell here anytime. Heaven can wait.